"Amey Wagh (अमेय वाघ)" the talented actor, Tv presenter and theater artist whom we had seen in every possible medium of entertainment and we all love him for what he do, has recently posted a poster of his upcoming movie titled "Muramba" on social media platform. He is playing the lead role in the movie opposite the "Cup Song Girl" and "Girl in The City" web-series fame "Mithila Palkar". 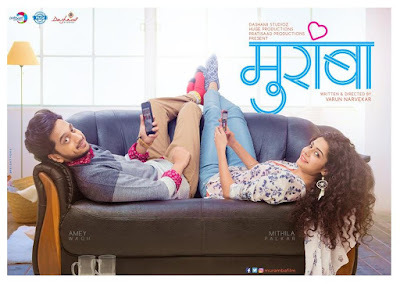 "Muramba" is a romantic movie which is directed by debutant director "Varun Narvekar" and produce by Ranjit Gugle, Anish Joag, Nitin Vaidya and Aparna Padgaonkar under the banner Dashami Studioz, HUGH Productions and Pratisaad Productions. The film will be releasing in 2017 summer.